My calendar-loving seven-year-old is already counting down the days to Valentine’s Day. I guess she likes to plan ahead! 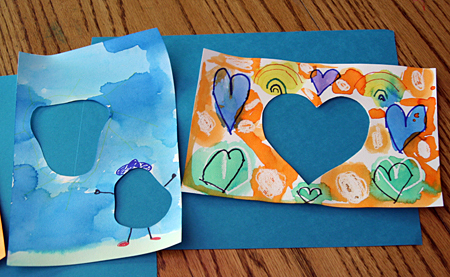 Our first “official” Valentine crafts of the season are these colorful hearts made with puddles of watercolor. Not only is the finished product beautiful, the process is really fun, too! 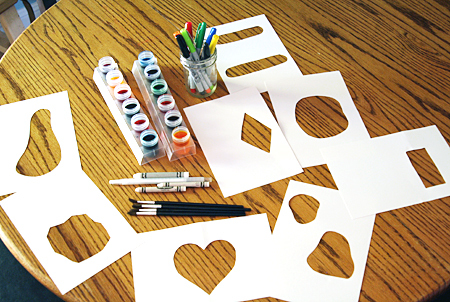 Get the how-to for this fun art activity at Make and Takes – see you there! My girls love setting a fancy table any time of year. 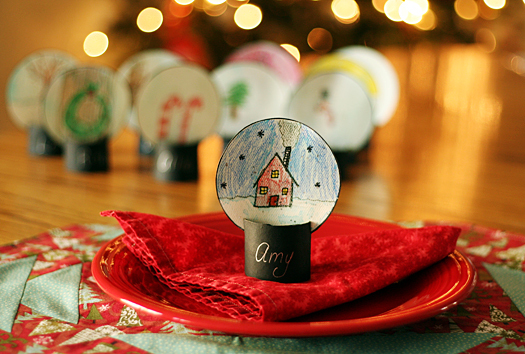 Holiday get-togethers are a perfect time to create some extra-special place cards, like our cute snow globe place cards! We’re planning to use these for our winter solstice candlelight dinner, and take them to my parents’ house for Christmas Day. I’m sharing the how-to at Make and Takes today – see you there! 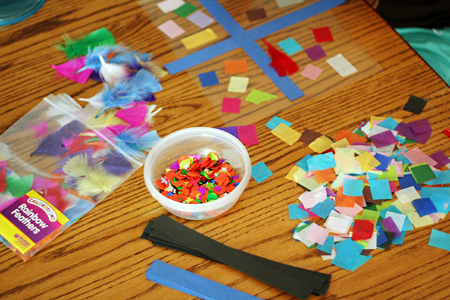 This week, the girls rummaged through our craft supplies and set-up a project for themselves. Love it! 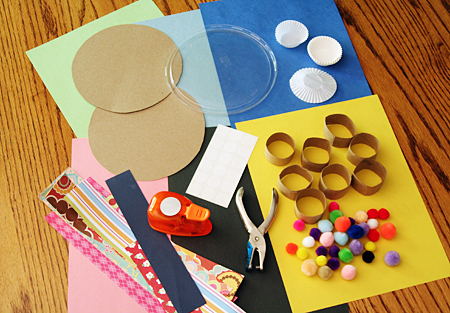 This is a fun, low-mess creative activity! 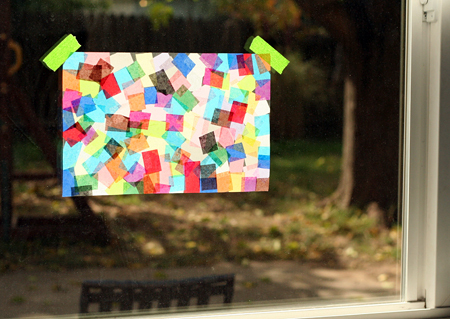 We have made these sun catchers many times, but the girls always love revisiting this project. Contact paper is one of their favorite supplies! 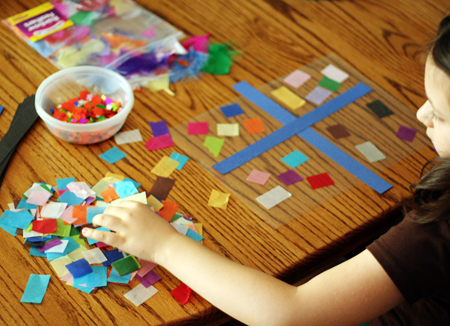 Have you set-up any free play art experiences for your kids recently? We don’t do scary around our house, but my girls do enjoy a little spooky fun this time of year. 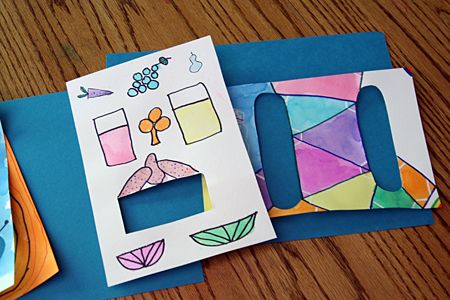 We recently spent an afternoon creating spooky house pop-up cards – it was so much fun! Come see our simple spooky house pop-up card tutorial over at Make and Takes! The girls loved making gifts for their friends and cousins for Christmas last year and I’m starting to collect ideas for this year’s holiday crafting. I shared Delaney’s mini clipboards last year, but I never shared Natalie’s project. 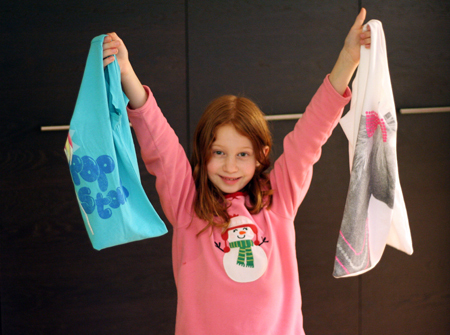 She made T-shirt tote bags – adorable and practical! We ended up buying graphic tees (kids size XL) on clearance for these bags. We also made a few smaller purse-size bags with t-shirts the girls had outgrown. Thrift store tees would work great, too! 1. Cut off the sleeves, leaving the shoulder seam intact. 2. Cut off the collar, creating a larger opening for the tote. 3. 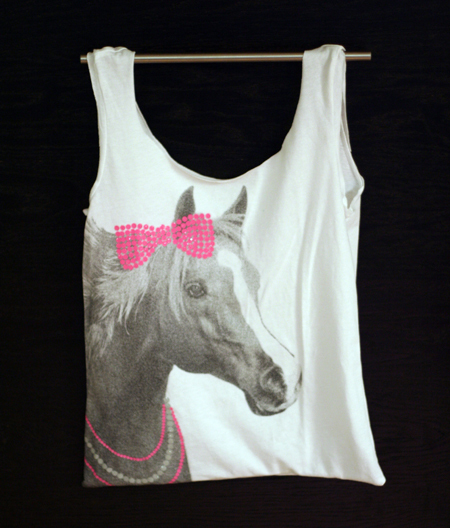 Turn the shirt inside out, pin the bottom closed, and sew shut. Only one straight seam to sew – perfect for beginning sewers! Family Fun and Martha Stewart have pictures & instructions if you need more help. The girls and their friends use the bags a lot and they are holding up great. Are you or your kids making gifts this year? What’s on your holiday crafting list? We had free play art last week when my nieces were visiting. They had a great time creating – it was neat to see all the different ways they chose to use the “hole” in their creations. Fun! I’m hoping to stay motivated and continue presenting interesting materials for free play art – the girls are loving it and look forward to it each week. I found a neglected bag of pom poms and some dot stickers and decided to gather up a selection of round-shaped things for our free play art this week. I have a feeling the mini cupcake papers are going to be a hit and the hole punch is always loads of fun. I wonder what they will create? I’ll come back and update this post with photos of their creations! Happy playing this weekend – we’ll be birthday-partying! We need to get back to some good ol’ open-ended art exploration around here. While the girls and I love doing projects with a “cute” finished product, I am also a big believer in encouraging and enjoying the process of creating. Our art supplies are pretty organized, which means they are inside cabinets and drawers. It’s good for finding things, but sometimes the “out of sight, out of mind” settles in. So, my plan is to set-out an inviting array of various materials and tools each Friday. I’ll be using the dining room table, since that’s where the creative magic tends to happen around here. If the girls are loving the materials, we’ll just toss them into a dish tub and pull it out again throughout the weekend. If my choices are a dud, then I’ll just put them away and move on to something new (or maybe do some art exploration of my own!). I grabbed a notebook and quickly jotted down a list of craft supplies and art tools from our drawers and cabinets, so I won’t have to think quite so hard each week. I’ll also be including plenty of recyclables (cardboard tubes, plastic lids, catalogs, etc. ), nature items, and random household items, too. I’m excited to see what the girls create with these materials, but most of all, I hope they just enjoy exploring and creating. Would you be interested in seeing our art play table each Friday? My girls and I love to explore painting with a variety of brushes and objects. One of our favorite explorations is with gadgets and tools from the kitchen. 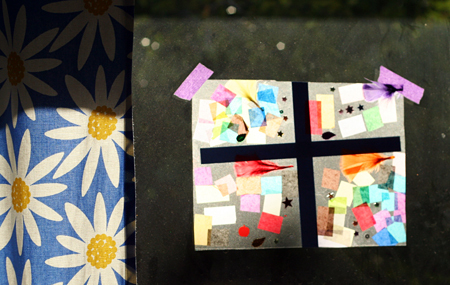 So, gather up some washable paint and an assortment of things from the kitchen. Try spreading a thin layer of paint on a paper plate or tray. 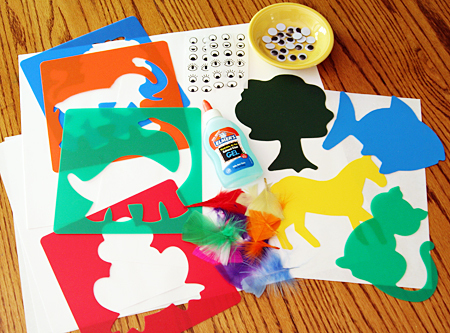 Your child can then dip a gadget in the paint and make a print on the paper. Some tools, like honey dippers and whisks, are also fun to dip into a cup of paint and then dab and roll on the paper. Experiment! Most kitchen tools clean-up well afterwards and you can continue using them in the kitchen. However, I also like to keep a box of kitchen gadgets that I don’t use anymore or that I find inexpensively for anytime painting and less worry about clean-up. A certain little girl in our house is one month away from her 7th birthday. She has been dreaming of and planning for a Toy Story Party since her last birthday – she has no trouble making decisions and sticking to them! For her party invitations, we decided to make a scene with her toys and take photos. The girls had such a blast setting-up the photo shoot, making sure all the toys looked just right. The photo is glued to the front of a card, with all the party details inside. Now onto the rest of the party planning – what fun!